Serious concerns have been raised by experts and environmentalists over the ‘shocking’ way spent nuclear fuel is being stored at Zaporizhia nuclear power plant, Europe’s largest, just 200km away from the front line in Donbass. More than 3,000 spent nuclear fuel rods are being stored in the open air in mental casks close to the perimeter fence at the Zaporizhia nuclear power plant in conditions that have shocked environmentalists, The Guardian reports. Nuclear experts say the waste should have another secondary containment structure, such as a building with a roof. “With a war around the corner, it is shocking that the spent fuel rod containers are standing under the open sky, with just a metal gate and some security guards waltzing up and down for protection. It is unheard of when, in Germany, interim storage operators have been ordered by the court to terror-proof their casks with roofs and reinforced walls,” Patricia Lorenz, a Friends of the Earth nuclear spokeswoman who visited the plant on a fact-finding mission, told the paper. Although the front line is for now too far away from the nuclear plant to be at any risk, the potential consequences of the conflict engulfing the power station is major worry to locals. The memory of the Chernobyl explosion in the north of Ukraine 30 years ago, which poisoned vast tracts of land, is still fresh in many people’s minds. “Given the current state of warfare, I cannot say what could be done to completely protect installations from attack, except to build them on Mars,” said Sergiy Bozhko , the chairman of the State Nuclear Regulatory Inspectorate of Ukraine (SNRIU). The current Zaporizhia nuclear fuel storage unit was built to a US design and did involve testing to withstand a terrorist attack. However a dry storage container with a bomb resilient roof and contained ventilation system would offer much greater protection. However this would be impossible to build on the current site and it would have to be constructed somewhere else nearby and then all the nuclear casks would have to be moved inside at even greater expense. “It is obvious that if you do not have an array of dry cast [interim] stores with secondary containment around it, then that will have a greater risk of release of radioactive material,” said Antony Froggatt, a senior research fellow and European nuclear specialist at Chatham House, London. Although sources at the European Bank for Reconstruction and Development (EBRD) told The Guardian that any request for funding for such a structure would be seriously considered. The bank has already made 300 million euros available to extend the lifespan of Ukraine’s ageing nuclear plants. 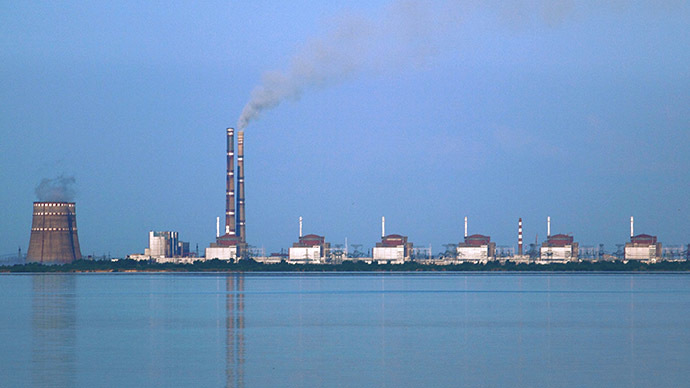 Since the conflict in Donbass has severely limited the supply of Russian gas, Ukraine’s reliance on its 15 Soviet-era reactors has increased by 10 percent; the country now gets 60 percent of its energy from nuclear power. Nuclear energy is one area where Ukraine and Russia still cooperate, and Ukraine still depends almost entirely on Russia’s Rosatom for enriched uranium. But in the long term Ukraine aims to diversify its nuclear fuel contract between the US company Westinghouse and European companies as well as Rosatom. But deals with Westinghouse and the French company Areva are still sketchy and market diversification will be slow.